If you want a high-protein snack and don't mind waiting at least a day to indulge, pickled eggs can be a good choice. Pickled eggs are a low-maintenance food that are traditionally prepared by submerging hard-boiled eggs in water and spices for at least 24 hours; the longer the submersion, the richer the flavor. As with other eggs, pickled eggs are high in fat, but you can eliminate the fat by removing the yolks. Pickled eggs with no yolks contain minimal calories, as the yolk contains most of the calories in the egg. One pickled egg with no yolk contains 27 calories. This amount comprises just 1 percent of the daily recommended intake of 2,000, so pickled eggs with no yolks can be suitable for weight loss plans. You could burn the calories in one such egg with less than six minutes of water aerobics or less than three minutes of jogging. 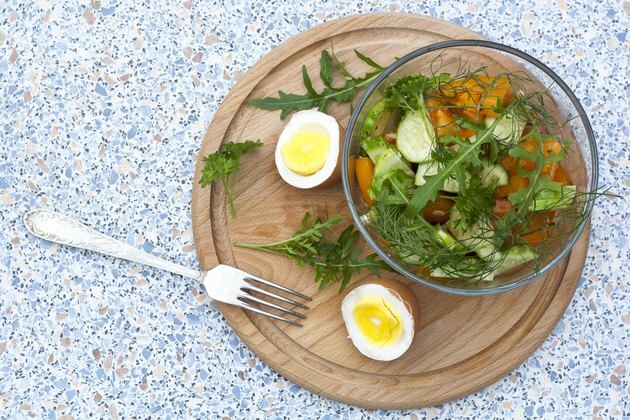 Pickled eggs can be a good source of protein, if you consume more than one. Each pickled egg with no yolk contains 4 g of protein, which is half of what a cup of milk contains. Protein is essential because it provides the amino acids that build and repair muscle and other body tissues. Eggs are relatively high in fat, but this fat is contained in the yolk. Thus, pickled eggs with no yolks contain no fat. As a general note, keep in mind that while fat is calorie-dense, it is key to growth and development, providing satiety and aiding in vitamin absorption. Pickled eggs with no yolk are carbohydrate-free. This can make the eggs suitable for low-carbohydrate diets, although they may not be ideal for athletic activity, as carbohydrates are the body's primary source of energy. If you're trying to lose weight, eating low-carbohydrate foods may be helpful; research from the July 2008 issue of "The New England Journal of Medicine" indicates that low-carbohydrate diets can be more effective for weight loss than low-fat or Mediterranean diet plans. One drawback of whole eggs is that they are high in cholesterol, so if you're watching your cholesterol intake, avoid the consumption of whole eggs. You can, however, eat pickled eggs with no yolk, as they are cholesterol-free; the fatty yolk is the source of the egg's cholesterol.